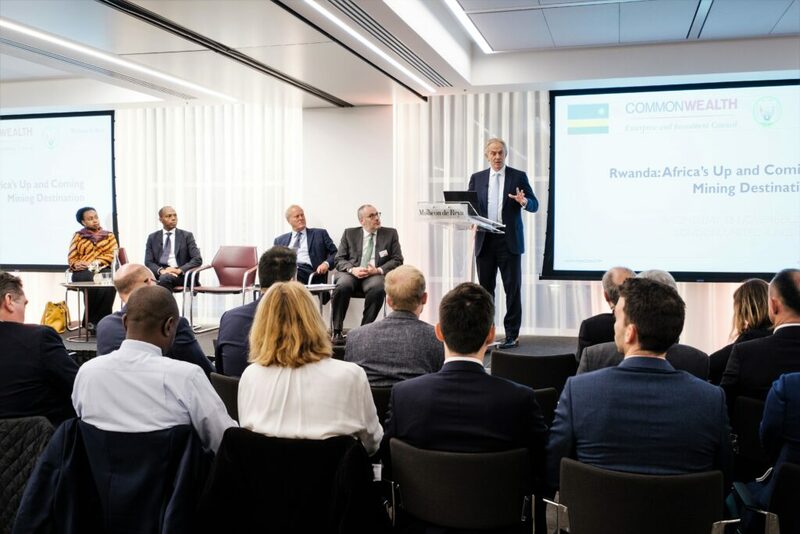 On Wednesday 28th November, The Commonwealth Enterprise and Investment Council (CWEIC), in partnership with the Rwanda Mines, Petroleum and Gas Board (RMB) hosted an event highlighting the considerable opportunity present in the Rwandan mining sector. Held at Mishcon de Reya LLP’s offices in Central London, the event featured company showcases from Rwanda’s most eminent mining companies (Piran Resources Limited, Power Resources Group Plc and Luna Smelter Ltd), as well as keynote speeches, networking breaks and roundtable-style interactive Q&A sessions. The Rwanda mining sector has shown very positive and robust growth figures, with a healthy increase of 21% in export revenues from 2016-2017. Combined with impressive sustained GDP growth of around 8% per annum for almost 20 years, the mining sector is poised to play an important role as a key stimulant for continued economic development. This sentiment has been echoed by the IMF, which highlighted investment in mining as a crucial contributor to overall national economic growth in the medium term. To that end, RMB recently set an ambitious target of generating US$1.5 billion in export revenues by 2024 annually, just over four times the $373 million revenue achieved in 2017. Attendees of the event were joined by a highly esteemed panel, including former UK prime minister and founder of the Tony Blair Institute for Global Change, Tony Blair, CEO of the Rwanda Mines, Petroleum and Gas Board, Hon. Francis Gatare, the High Commissioner for Rwanda, H.E. Yamina Karitanyi and Chairman of CWEIC Lord Marland of Odstock. Participants represented all points of the mining industry’s supply, advisory and finance chains across a variety of mining sectors, from gemstones to battery metals. The wealth of diversity facilitated active participation and discussion in the open elements of the event, with dialogue reinforcing Rwanda’s stability in the region, and its commitment to transparency – all factors which are conducive to reducing non-tariff barriers for those wishing to access the market. Given Rwanda’s position as the succeeding Chair in Office of the Commonwealth, and as hosts of the 2020 Commonwealth Business Forum in Kigali, the country has emerged as a key Commonwealth investment destination, with strong trading and ease of business credentials.